New load cells from METTLER TOLEDO provide cost-effective weighing with superior accuracy and compliance to common industrial standards. The new SLB215 and SLB415 nickel-plated steel load cells with hermetic sealing offer the same performance and reliability as their more expensive stainless-steel counterparts. 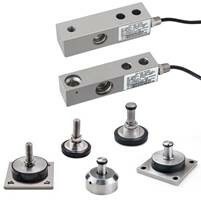 Hermetically sealed Both the SLB215 and theSLB415 load cells are made from nickel-plated steel.